360 ° + 4 cameras can effectively solve the problem of sorting accuracy. Almost all kinds of granular materials can be separated by CSG with a good sorting performance Annual Capacity is 5000 set machines. Fast delivery time, 10 sets order processing capacity per day. also have different configured spare parts machine to suit for different market. Large oversea market share and high reputation in color sorter industry. CSG are sold more than thirty countries and regions including the China, USA, Europe, Japan, Russia, India, Sri Lanka, Bangladesh, Guyana , Brazil etc. Full-color high-definition CCD camera image acquisition system, the material (RGB) red, green, and blue color information to obtain a comprehensive, small depth to identify and elaborate common color sorter can not choose other impurities. International high-end full-color line scan technology, DSP + FPGA international advanced processing technology, combining a variety of colors and shapes with pattern intelligence complex algorithm to provide for different materials "color option + shape selected" solution, a variety of modes set free. On the request of customers for sorting out specific objects, customization is available and accordingly a complete set of solutions can be offered. The company has established a dedicated R&D center and a R&D team composed of experienced engineers and headed by leading optoelectronic experts in China, who have been keeping up with leading-edge photoelectronic technologies in color sorting. Moreover, the company has established in-depth technology cooperation with foreign companies, especially a well-known U.S. producer of color sorters. 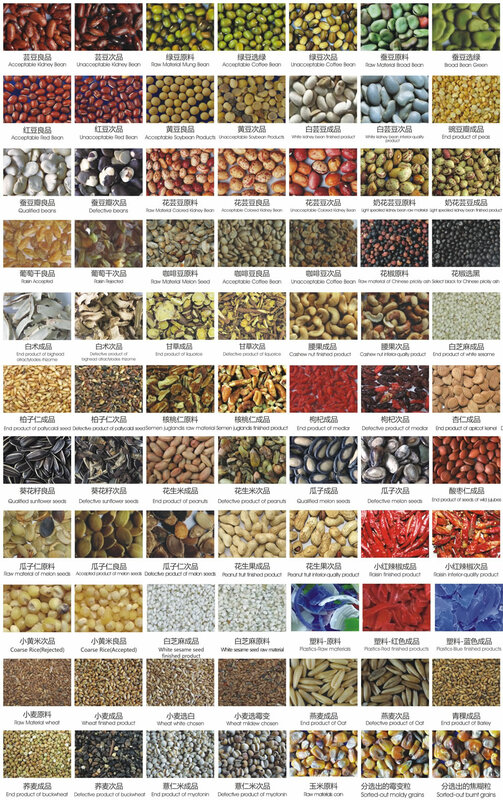 In particular, the cooperation has brought significant achievements in the research of CCD color sorting technologies, and made great contributions to China’s technological progress in sorting coarse cereals and special materials. At present, the company is offering a complete range of sophisticated color sorters. Meanwhile, on the request of customers for sorting out specific objects, customization is available and accordingly a complete set of solutions can be offered. The company is looking forward to establishing cooperation with customers for mutual benefits and common development. CSG is a high-tech enterprise specializing in the R&D, production and sale of intelligent color sorters. with an area of 100,000 square meters, 22,000 square meters of modern workshops, have an annual production capacity of 5000 sets of intelligent color sorters and an annual output of 200 million, and become one of the largest production bases of intelligent color sorter. Copyright © 2003-2017.CSG All rights reserved.